If you go several days without drinking water, you’ll be in a world of trouble. But the idea that eight glasses a day is optimal — well, that’s soggy logic. In 1945, The Food and Nutrition Board of the National Academy of Sciences claimed that the body needed two-and-a-half liters of water a day — without citing a clinical study! In a 2011 article published in the British Medical Journal, that myth was debunked. The study’s author, Margaret McCartney, noted that this spurious fact had been widely disseminated by a water-advocacy group called Hydration for Health. The group was created by the French food giant Danone — which happes to own the Volvic, Evian and Badoit bottled-water brands. Quelle surprise! New guidelines by the Institute of Medicine are more specific. They recommend 91 ounces of water per day for women and 120 for men. However, they note that "the vast majority of healthy people adequately meet their hydration needs by letting thirst be their guide." Caffeine can raise your heart rate, boost your workout and boost your metabolism. Don’t worry that that a cup of coffee or tea will cause your body to shrivel like a raisin; their diuretic qualities are largely overblown. "Recent research shows that caffeine doses between 250 and 300 milligrams — about two cups of coffee — will minimally increase urine output for about three hours after consuming it," says Susan Yeargin, Ph.D., assistant professor of athletic training at the University of South Carolina. But the research also shows that exercise seems to negate those effects. If you run within one to two hours of drinking coffee, you don't pee more. "It’s thought that blood flow shifts toward your muscles and away from your kidneys during exercise which means that urine output isn't affected. The “everything in moderation” dictum should even be applied to water, according to scientists. Drinking too much can cause symptomatic hyponatremia, a condition in which the sodium levels in the blood become dangerously low. Sodium balances the fluids in and around your body’s cells. Drinking too much water can cause an imbalance, in which the excess liquid moves from your blood to inside your cells, causing them to swell. Under normal conditions, you’d have to drink a huge amount of water to experience hypernatremia, which is also called “water intoxication”. 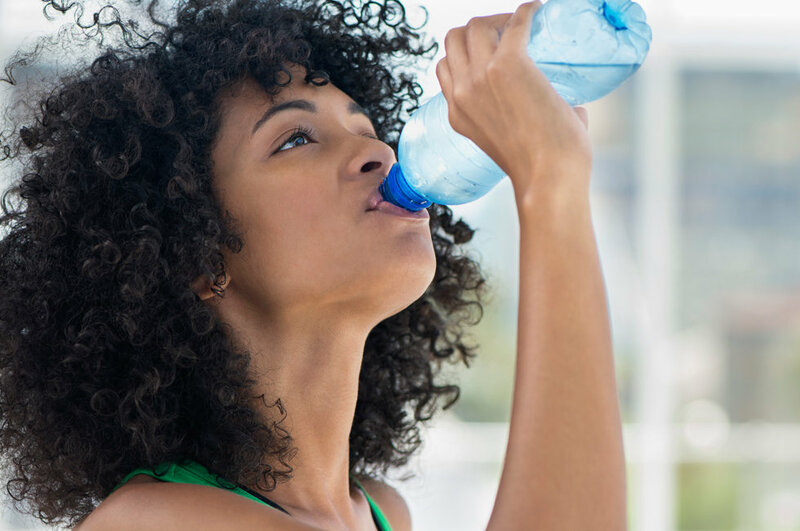 However, if you’re a serious runner or a particularly salty sweater — indicated by white streaks on your skin and/or clothing after you run — you could harm yourself by downing H20 too quickly. For these people, sports drinks such as Gatorade can be useful in replenishing sodium and electrolytes in the body. The day before a race or an intense training day, drink extra water and other nutrient-rich fluids. On the morning of the event, drink two cups of fluid two hours prior, giving your kidneys enough time to process the liquids and you enough time to pee before the start. Thirty minutes beforehand, drink another five to ten mouthfuls of water or a sports drink. Experts say that for each pound lost during exercise, you should drink an additional 16 oz. of fluid. That means that if you drank 8 oz. while exercising for 60 minutes and lost one pound, your goal is to drink an additional 16 oz. during your next hour-long workout. That means you would need to drink a total of 24 oz. to ensure proper hydration, or about 6 oz. of fluid every 15 minutes. For each pound lost during activity, drink 24 oz. of fluid. If your body weight has increased, you’ve overhydrated, and you should drink less fluid in future exercise sessions. And to burn fat even quicker, don’t miss this essential list of 55 Ways to Boost Your Metabolism—Fast!